Binfire is a web-based project management and collaboration software development company. Binfire specializes in providing in organizational services for web-based companies. Binfire can help virtual, in-office teams, and teams that are a combination of both collaborate on tasks; to that end, Binfire includes an interactive whiteboard to foster more open collaboration. With Binfire’s project collaboration software, sharing, and editing has never been easier. Workers have access to advanced digital white boards that facilitate open communication of required updates and changes. The project diagnostic page is an essential part of their project collaboration software, as it helps users understand the nature of current projects and allows them to view their progress in real time. An advanced proprietary algorithm projects the chances of a project being completed on time at the current rate of production, updated in real-time. 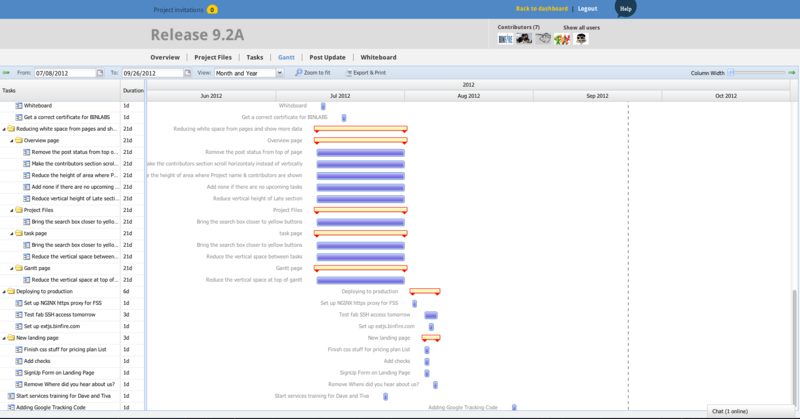 The collaboration software also provides a burndown chart that shows workers and managers the exact, distributed breakdown of progress on a particular project. This makes accountability much more managable. With Binfire’s project management software, everything, even tasks, can be customized. Binfire can color code tasks based on completion and set deadlines to help workers stay on track and ahead of the project development curve. Relevant files and tags can all be incorporated into the project scheduling software, too. With its focus on integration, Binfire is ultimately designed to be the central point from which the rest of your business and project can be managed. Review more of the top Project Management solutions with the SmartAdvisor. Learn everything you need to know about Binfire. Our experts will reach out to you shortly.